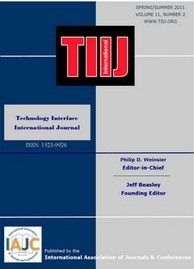 The Technology Interface International Journal (TIIJ) is an official journal of the International Association of Journals and Conferences (IAJC). TIIJ is a peer-reviewed open access journal covering broad topics related to engineering technology, with a focus on teaching. TIIJ is steered by IAJC distinguished board of directors and is supported by an international review board consisting of prominent individuals representing many well-known universities, colleges, and corporations in the United States and abroad. To maintain a high-quality journal, manuscripts that appear in the TIIJ Articles section have been subjected to a rigorous review process. This includes blind reviews by three or more members of the international editorial review board, followed by a detailed review by the TIIJeditors.